Horseradish is a minor crop in New York, with 5 acres produced on 8 farms (2007 Ag Census). Some of the smaller acreage is probably not reported. It is a member of the Brassicaceae or cabbage family which makes it related to turnips. The greens are edible and may be available at farmers markets in the spring/summer. 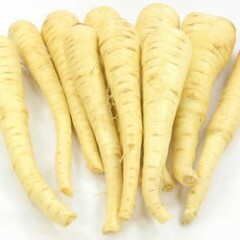 However, the pungent root is generally what is cultivated and sold. Roots are generally harvested in the fall. They store well and are available throughout the winter.